If you share your birthday with famous people born on FEBRUARY 8, you are an extremely gifted Aquarian. You probably have hidden psychic abilities that need to be nurtured. 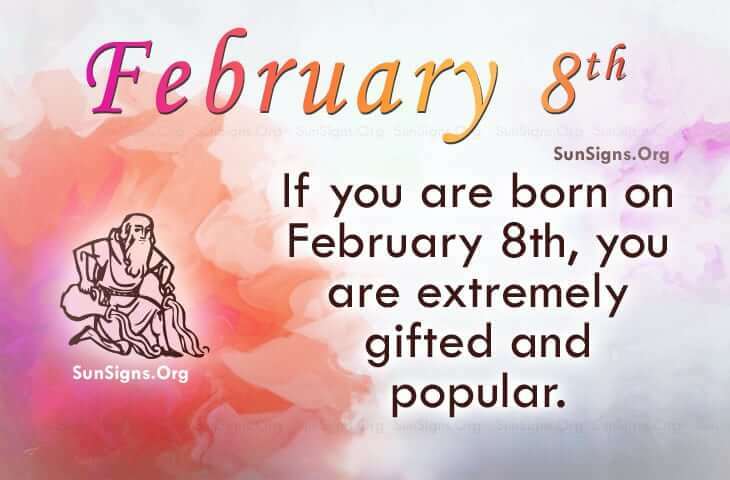 Being born on this date 8th February, famous people are given extra qualities and it can be challenging getting to know them. They are known to be tolerant but straightforward. They can also be stubborn as a mule. It’s not easy for this person to trust others but once it has been established, you could have a friend for life. In the romance department, famous people born on February 8 may have had some upsets but this too shall pass. Learning to focus on one goal at a time will alleviate some stress related problems. Money matters to them but their freedom comes first. As far as their health is concerned, if you share this February 8 famous birthday, you may need to look for an alternative lifestyle. Perhaps invest in a juicer and make your own protein shakes and prepare organic meals. And get some sleep! Like other famous people, if your birthday is on FEBRUARY 8th, you can be creative, shy and gentle depending on what side of the Aquarian coin you toss. These famous people are unique and determined. What this February 8 famous birthdate says about you is that your past may have negative affects on you today. Most of you are difficult to know.